Annotation: Unable to leave her house, biracial 18 year old Madeline Whitter’s world changes when a new family moves in and the boy next door starts challenging everything she’d ever known. Plot Summary: Severely allergic to the world, 18 year old, half Japanese, half African-American Madeline “Maddie” Whitter has never been outside in 17 years. Diagnosed with severe combined immunodeficiency, a rare disease that causes people to become easily vulnerable to infectious diseases through anything and everything. The sterile white walls of her room is Maddie’s main world with deliveries going through a special decontamination process and visitors submitting themselves through a background medical history check, a comprehensive physical, and essentially a hot air bath for an hour. Her only experiences with the outside world is through books, the Internet, and her daily interactions with her physician mother and her nurse, Carla. Maddie’s content in her life with her books, her models, and her two best friends… until one day, everything changes. For years, the house next door to Maddie’s sat empty. One day, a moving van appears and a family moves in. A older man and woman, a girl younger than her, and Olly – a lean figure all in black whose first glimpse includes watching him run six feet off the wall of the house. A boy who seems to push at gravity and life’s boundaries. A boy who sees her watching from the window. A boy who is interested in getting to know her. At the beginning, Maddie simply observes watching this boy and his troubled family, but contact quickly happens. An indestructible Bundt cake leads quickly to email exchanges, but soon even that is not enough for Maddie. Maddie’s world quickly expands and she soon grows restless in her white room. She craves to be with Olly and yearns to experience the outside world with all its possibilities. Critical Evaluation: “I’ve read many more books than you” opens the story and soon one falls irrevocably in like with Maddie. Everything, Everything is told through Maddie’s point of view and what a voice it is. Simple, open, and engaging – it is never difficult for a reader to step into Maddie’s life and its limitations. From her complicated relationship with her mother to falling head over heels with Olly, one cannot help but root for Maddie at every step of the way. Highlighting Maddie’s voice, Yoon intersperses her narration with sweet doodles and drawings done in pencil adding to a reader’s understanding of Maddie’s perspective of the world. Also present is charts, instant messaging, and email dialogues creating a novel that fully immerses a reader not just traditionally, but visually as well. The nontraditional storytelling elements lends itself well to the unique voice and perspective of Everything, Everything. 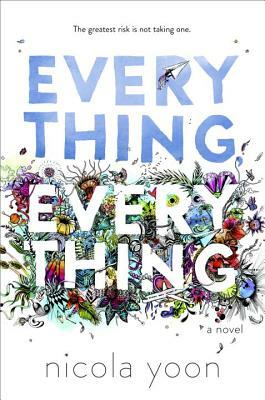 Severed combined immunodeficiency is a rare disorder and unlike Maddie, most teens can come and go without the risk of being allergic to the world – the themes of Everything, Everything still powerfully resonate with their lives. Maddie literally straddles the world where she is safe to the wider risker world around her and that is something teens deal with daily – weighing choices, pushing parental boundaries, and risking mind and body. The philosophical introspective elements explores life, hope, and the risks of love. Yoon also touches a little on the issue of domestic violence and medical ethics though the topics are not as well explored. All in all, a heartwarming story with powerful themes.